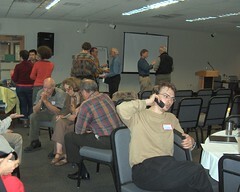 Organizer, Chris Lindstrom and others at the Burlington conference. A currency is a means of payment, denominated in some defined unit of account. I’m well familiar with the WIR Bank: see info at http://reinventingmoney.com/documents/wir.html and on this blog.